Contrary to popular belief the local MC club doesn't only live on gasoline fired wheeled chainsaws. Far from it. And because we are open to all forms of recreation we happen to recreate more than your average stooge. Skateboarding, paddle boarding, snowboarding, skiing, Nordic skiing (who knew? ), snowmobiling, back country, walking, hiking, back packing, mining, dog training, camping, farming, fishing, mountain biking, shooting, community gardening, hunting, road biking, motorized boating, non-motorized boating, every sport under the sun and gym roofs too, triathlons, biathlons, etc. Well I think you can get the picture as this list could easily go beyond the limits of a single screen page. So what's the beef with USFS and FOI? In their efforts to re-arrange the forest to deny motorized access they've also closed much to non-motorized. It's not a huge amount but it affects us directly for now certain trails we've biked, walked, or brought the dogs out for have been closed. The toughest part about the whole thing is trying to talk to someone about it as you, the reader, will see. We believe that some out there would prefer to go about the road/route/trail closing business and not have to deal with the inconvenience of the public asking difficult questions. We can understand that mindset because if one is in the middle of a lucrative contract and closing contested access who would ever have thought that accountability would have been such a large component. Accountability may seem like a drain on resources because individuals might actually have to do some research, identify mistakes, fix previous work, and follow up. Accountability doesn't pay or generate new dollars. Accountability may very well be the new dirty word of 2012. Last summer our PR Officer noticed a few popular mountain bike trails go by the wayside as a direct result of travel management. Reaching out and asking why he quickly uncovered the slippery slope of the agency shuffle. Conflicting information, derogatory comments, and even some "lost" paper work all added to the spiral down to questioning even basic fundamentals - like what the hell just happened? Does anyone care at this point? Do I? Please browse the unabridged email chain below. Through this email I'm hoping to clear up an old issue that I had brought to your (and others) attention last year. You can click here to read about the issue in question - it's regarding the "Friends of the Inyo's" illegal closures of mountain bike trails in the Shady Rest Park area. The last time we talked about this issue was during that meeting we had with Sixto and others at the Good Life Cafe. During that meeting I pushed for answers as to why this was allowed, and you informed me that the mtn. bike trails in question aren't even considered to be "legitimate" trails. You said that they aren't on any map so the FS doesn't consider them as "official," and the fact that people use them on a regular basis is irrelevant. "Travel Management" trumps all I guess. You also explained to me that the trails were put in by Mark, and he didn't really get the proper permission to do so. I was a little surprised to hear your explanation, but didn't question it at the time, and eventually placed the issue on the back burner. Stacy responded to my initial email as well and told me she was going to personally visit the area in question and address my concerns - I never heard back from her. Mark actually attended our last M/C Meeting, and he had an entirely different account on how those trails came to be. Mark told me that he invested hundreds of hours in getting those trails put in - legally. He said that you had worked with him on the project as well, and those trails are far from "unofficial" - especially because an "Environmental Assessment" was done on all of the signed trails (signs that were eventually picked out and installed by the FS department). Mark was a little concerned about the accuracy of your statement, and was worried that all of his hard work might be getting "swept under the carpet." My Brother and I actually worked quite a bit with Mark and Sandy Hogan in the fight to preserve public access back in the late 90's. Mark also added that the EA in question is public record and I could see it if I request to do so - I will. Our club would like to see all these Shady Rest mtn. bike trails returned to their original and intended purpose... Visiting and local mtn. bike riders (hikers, dog walkers, and tax payers) shouldn't be blocked from using these trails, and they certainly should not be tricked in which direction to ride. We would like to see the signs spun back to their original location/direction, and trails restored to an acceptable and usable condition. Not too much to ask really, especially when we're all committed and dedicated to the preservation, exploration and stewardship of this region's public lands. I recall Jim Upchurch promising the public that non-motorized travel will not be affected by TM implementation. We shall hold him to his promise, whether he still works here or not. I've forwarded this email to John K., Stacy (FOI), and the Mammoth Motorcycle Club. Hopefully, once the snow melts, we can all work together to remove all the barricades that have been mistakenly installed by the FOI. Our local club is open to suggestions and has volunteers standing by to restore access to this area. Thanks for your understanding, and I look forward to your response. The Forest was implementing the 2009 Motorized Travel Management decision when routes were closed to motorized vehicles in the Shady Rest area – regardless of the type of crew that conducted the work. No illegal closures were conducted by any crews in that zone. We will continue to implement TM, based on the FEIS/Record of Decision. The placement of barriers may be a slight inconvenience to bikers and hikers, but there is no prohibition of their use; and apparently these users are continuing to enjoy the trails (when there’s not snow). The Ranger District is looking into the documentation of planning that went into the trails in the area. They have already worked with Mark Davis on this, and are working toward resolution of some of the concerns as well as potential improvements to the mountain bike network and mountain bike experience. Details about signage will also be worked out. Forest and District staff are very interested in resolving these issues, and are working with appropriate individuals to develop solutions. If you feel you need more information, or want to offer assistance once the issues are worked out, please contact Jon Kazmierski, District Recreation Officer. Thanks for the reply Marty, but I'm not quite sure if you know the extent of how these particular closures were implemented. We should meet out there one day and take a close look. "...The placement of barriers may be a slight inconvenience to bikers and hikers, but there is no prohibition of their use; and apparently these users are continuing to enjoy the trails." Well if that were true I wouldn't be writing to you. I couldn't even walk my dogs down them, let alone ride my mtn bike down them. I'm at work right now, but when I get home I'll send you some pictures of the conditions of these trails. They are completely covered with branches and there is NO access for non motorized users. Like I said in my previous e-mail, we were promised by Upchurch that non motorized access would not be hindered during implementation - and it surely is. Not to mention, these "friends of the Inyo work crews" moved some of the directional arrows around so mtn bikers will eventually become lost - I think this might be another illegal activity. If not illegal than definitely irresponsible, wouldn't you say? The "FOI" group needs to correct these sloppy implementation practices, and our group would like to help (manpower wise). I fear that these practices also set a bad example for everyone that recreates in the area. someone might think that if the FOI can do things without taking responsibility or care, then they can as well - and start making changes of their own. I for one wouldn't like to see that happen, as it is a step in the wrong direction. Mark told me that there was an environmental assessment done on these particular mtn bike trails. Can you tell me if that was the case, and if so how do I go about requesting to see this information? Also, Please correct me if I'm wrong, but I was under the assumption that if the proper steps were taken and an EA was done, then these trails should be protected in some way, and these mtn bike trail closures should maybe be reversed and restored back to their original intention. Non motorized trail closures shouldn't have been included in TM related closures, right? Also, if I sent this e-mail to you in error then I apologize, i thought you were the one that would field these types of questions. I have CC'd this email to Jon, hopefully he can respond to this. And hopefully the FOI can respond as well - so far I haven't heard anything from them. I'm really glad you're concerned about public lands and that you want to work to improve recreation on the forest, but I am very frustrated by the false allegations in your email (such as "these "friends of the Inyo work crews" moved some of the directional arrows around so mtn bikers will eventually become lost"). Friends of the Inyo staff did not move mountain bike signs or do anything illegal while working to implement the travel management decision, under the direct supervision of Inyo National Forest staff. I can agree to disagree with you about the merits of the travel management process. I can even accept that you don't like what FOI does. And I'll keep explaining what we do and why we do it until I'm blue in the face, but I will not tolerate lying. If we can agree to stick to actual facts, I think there are many ways we can work together. As a point of informational clarity on the mountain bike trails, I was at a meeting in Mammoth last Thursday at which Mark Davis asked Sandy Hogan (former Mammoth District Ranger) about the mountain bike trails he developed, and she confirmed that NEPA was done for those trails, so those documents must exist somewhere, which is good news. Mark noted his disappointment that these trails have fallen into disrepair over the years due to fuels reduction activity and general lack of maintenance, along with potential impacts from travel management implementation. I agree that the trails suffer from neglect and that signs are missing. Mark says he has a bunch of extra signs and sign posts, so once the Forest Service locates the decision record, there's potential for a great project to maintain the bike trails. At that same meeting, there was much interest in a Shady Rest/Inyo Craters working group--a collaborative effort to plan recreation on forest lands north of town. When that happens, I look forward to sitting at the table and working together to improve both motorized and non-motorized recreation in these areas. Before then, could we go out with you and take a look at the specific places you're concerned about--in Shady Rest and elsewhere? When's a good time for you? Paul McFarland's copied here and is our staff lead on travel management/front country recreation projects, so please include him in your reply. His phone number is 760-709-XXXX. "The work that FOI’s crew and volunteers do is performed according to very specific guidelines, with clear reporting procedures and under the direct supervision of INF staff. That doesn’t mean it’s all perfect all the time; regarding our crew’s recent work around Shady Rest—I’ll go take a look at these closures today and follow up with INF staff. If errors were made by our crew, we will work to fix those errors right away." You never followed up, your group didn't fix the signs that were turned around, and I never heard from you again. You didn't respond to my brothers email either - regarding the many safety concerns on the "Crater Loop" OHV trail. You might want to brush up on the entire story (with pics) and e-mails HERE. To be honest, I wasn't too surprised that you didn't respond. Your group doesn't use OHV vehicles/trails for recreation and these issues are of little concern to you. But what does surprise me is that you are now calling me a liar. Are you kidding? Did you even go out there, or are you just assuming that I'm lying to you? I'm sorry if it's hard for you to swallow, but non motorized users expected a little more consideration during this whole thing - we both know very well that the motorized users didn't get it. Who do you suppose actually moved the arrows? I figured that it was the same individuals that were responsible for messing up the trail with large branches and rocks. But regardless, if the FOI implemented the closure and erected the barricades, then it's the FOI's responsibility to keep these trails open for non motorized use - your group DID NOT (not a lie). The "kids" that you hired to close roads showed no concern for other user groups - especially around the Shady Rest area. They wanted to close as much as they could as fast as they could (and I'm sure this was their directive too). One of your workers told me all about the "close happy" behavior he saw during is time working with you (I actually witnessed it as well), and he actually felt bad about doing it. He told me that some of your employees even "took it to the next level," and would return to areas on their day off to erect blockades and improve on "trail destruction" - unsupervised. It's unfortunate, but destructive changes to our public lands were made by your group last year (in the name of the TMD), and the worst part about it is that it didn't just end with motorized trails. Destruction spilled over to non motorized trails as well (sorry, this is not a lie). I consider these encroachments to be illegal in nature as the TMD was not to be used to include non motorized access. No exceptions. No lies. "Ranger Rick" Laborde (actual USFS employee) once told me that if "access isn't blocked to everyone then motorized users would be tempted to ride on the trails again." Ricks comment came at a complete shock, but "Ranger Lisa's" comment (another USFS employee) was even worse... She said "Hikers, mtn bikers, etc aren't allowed on these trails because they're closed, and closed means closed!" In addition to this type of backwards thinking, the USFS has also put a "rush order" on the so-called "implementation" process (as I'm sure you know) - just like how they rushed through the scoping process. Unfortunately, the FOI has decided to following suit, ignore the promises that were made during the TMD, and do whatever they deem appropriate. In return, the FOI (and the USFS) will then take full responsibility for the quality of closure (or lack thereof) and for any dangerous conditions that may be preset as a result. This also includes rouge employees who want to do "a little extra" to help out the cause. In addition ...there were changes made that were not approved by the USFS, but attempted anyway by employees of the FOI (shrinking the Inyo Craters parking lot for one), and these will also rest on your group's shoulders. Fortunately for us all, this particular incident was stopped by the Mammoth Motorcycle Club. "...Finally, my two cents: I acknowledge the shock of seeing things change on the ground, especially at a popular, very accessible place like Shady Rest. I understand that you’d feel frustrated to see a multi-use/mountain bike route be closed as part of an effort to address motorized use. I feel frustrated about some of the things I see out there, too. As a frequent user of the forest lands around Shady Rest, I’ve noticed tremendous route proliferation in the area. Sure, I learned through trail trial and error to negotiate the myriad unsigned routes over the years, watching as routes widened, eroded and new routes formed. Personally, I can’t accept that this is the type of experience or level of management we should settle for on our beautiful public lands." Your group openly advocates for "sustainable, (and) responsible recreation on the Eastern Sierra’s public lands," and you claim to "work to make that a reality through on-the-ground stewardship," but is this really what is happening? Once your group finishes the implementation process, are you then going to pay these employees to help the OHV community develop and build it's trail system? No, that wont happen, as we wouldn't want to confuse these employees now would we? This might be a stretch, but perhaps the FOI has taken this whole thing a little too personal from the very beginning, and has lost sight of their actual mission. Your friend Paul McFarland told me once that he dislikes dirtbikes (in not so many words), and bragged to me about how he had to "chase down" and perform a citizens arrest on a group of dirtbike riders. He claimed that they had been riding off trail and were using "competition bikes," with "competition exhausts" (Not sure what that had to do with it, but I assume he's an expert on the topic) - a personal grudge? How many years did they get Paul? Paul also played a major role in deciding what stays open and what gets closed (during the TMD). An obvious conflict of interest, or just a concerned citizen? I mean it's not like he had paid employees commenting on closures was it? You bet! Thanks but no thanks. I'm not interested in calling him, and I'm not sure what the point is in including him in these emails either. Getting together for another meeting sounds like fun, but I'm sure we can both agree on the fact that they accomplish very little... Paul, like everyone else who would never participates in OHV recreation, has the same old song and dance: "the TMD is over, sorry...you should have participated more," or "We are doing what needs to be done...we're managing the trails," or "Agree with it so we can move on..." and my favorite, "ITS THE LAW so deal with it." Paul isn't alone in this type of "thinking" either, as the USFS has trouble seeing the forest for the trees too. Everyone knows that the TMD decision trumps everything... even common sense. Finally, whether I agree with what you are doing on our public lands or not is irrelevant. But just for the record... Our public lands are open to everyone, and access is our natural born right - whether you like it or not. The FOI will not use the TMD to deny access to non motorized users, and until you accept that I cannot agree to work with you. I will not allow this behavior to go on unchecked, and I'll continue to document all closures that the "FOI" are responsible for - past and present. Sixto might not mind too much, but Mammoth Lakes locals and it's visitors expect more and will hold your actions accountable. I'm afraid we're at an impasse here. I don't have the time or the inclination to argue with you anymore. I stand by all I've said and our work. If you have questions and concerns about the work we've done under agreement with and supervision of the Inyo National Forest, please address them to forest staff. I'll see you at the upcoming collaborative recreation planning meetings when they happen, and maybe out at Shady Rest where I run and walk my dog several days a week. Unfortunately the "forest staff" you speak of are all "busy" doing other things - more important things. I ask Marty and he refers me to Jon. Jon just ignores my emails, and you just refer me back to them. HAHA! Your organizations have a lot in common. NGO? Not really. Perhaps a new acronym could be FOIUSFS? I'm over it, and this e-mail is already too long. There was significant discussion at the last MLTS CC meeting regarding the status of the trails that Mark Davis worked on many years ago and that you referenced in your last email to me. Sandy Hogan - who is on the MLTS CC - responded to Mark Davis that the appropriate legal documents were completed to make all of those trails official USFS system trails back when she was with the USFS. Kazmierski said something to the effect that he can't find paperwork etc - what matters is that there seems to be some real confusion as to the status of those trail and that needs to be cleared up. Do you have some time to talk this over in the next couple of days - ? Let me know when you've got some time to discuss. The next MLTS CC meeting is April 11 at 3:00 and there's also a Mammoth Trails meeting on April 19. I'm happy to go out and talk on the ground about any of these issues. Name a time and a place and we'll go from there. I'm not interested in playing back and forth games, but in getting things done on the ground that work for people and the land. If there is actually something that can get done by meeting and talking then let's do it, and I'm pretty sure there is. If not, I am sure we can all find other things to do with our time. Well I don't know Paul.. Is there something "that can get done?" You tell me. I would suggest that you take some time and read the "back and forth game," (as you call it) and let me know. I could be wrong, but usually e-mails are exchanged amongst people to obtain answers, ask questions, and or collect different types of information about different things - it might be a game to you, but it's not to me. My original email was directed to Marty, and asked for info on mtn bike trails that FOI decided to close. He told me once that they weren't actually legal, now I'm finding out that he was mistaken. Marty couldn't even answer my question. Mammoth Lake locals would like them re-opened so non-motorized could use them - right now they're unusable for any type of non motorized - too much rubbish in the way. It's simple really. Your group was involved with the closure so a simple yes or no would suffice. Stacy was included in these e-mails, and she gave me the run around and called me a liar. She stands by her groups work no matter what they do - that's obvious. What's the point of meeting up if I'm going to hear the same thing from you? That would be a real waste of time. Congratulations if you've made it this far. 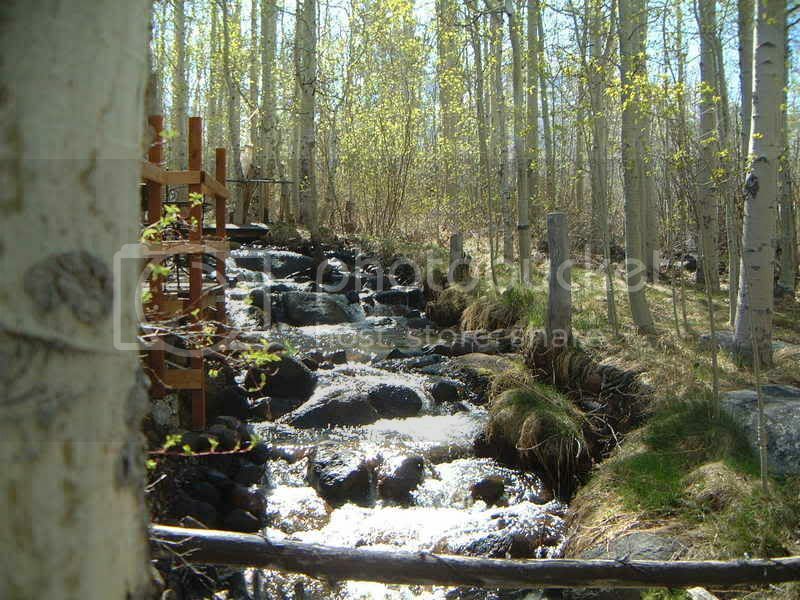 Spring is here and it found my 6 year old son and I in the back yard tending to our aspen glade and creeks. When we pulled back the winter's layer of leaves we saw that all of the aspens were connected by the same network of roots. We can understand that FOI is a large organization with many individuals involved as paid staff or passionate volunteers. However, will the front-country accountability please stand up? It's the right thing to do especially when acting as the new de facto landlord of our public forest. All of the aspens grow in clonal colonies derived from a single seedling.